Anna Pantelidou, a Ph.D. student in the Department of Electrical and Computer Engineering advised by Professor Tony Ephremides (ECE/ISR), conducts research focusing understanding the coupling between the physical layer and the layers above it in wireless networks. We live in the era of ubiquitous networking where the trend in communication has shifted almost entirely into wireless systems that promise high data rates in the order of megabits per second. In order to guarantee service “anywhere” and at “all times” the networks of the future are envisioned to be totally wireless, deployable in an ad-hoc manner, without the need of a preexisting infrastructure. Thus, these systems will be deployable in a variety of different environments, from disaster recovery operations and battlefields to personal communication and data exchange, to name a few. Data from each source will travel in a multi-hop fashion, from one node to another, until it reaches its intended destination(s). In reality though, except for some very special cases of single-hop communication, such as cellular networks, the promised high data rates are far from being realized. Thus, the emerging need to support the increasing growth of traffic from a plethora of new applications and services necessitates progress in understanding the real limits and capabilities of wireless networks. At present our knowledge regarding how to operate these networks is still limited. The lack of infrastructure introduces an interaction between the physical layer and the higher layers of the protocol stack, especially with the network and medium access layers. However, this coupling among the layers is far from being understood and only recently did the research community start to address this issue. 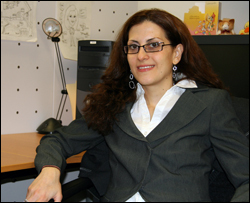 Ms. Pantelidou’s research in understanding the coupling between the physical layer and the layers above it is an essential step before the realization of any meaningful multi-hop wireless system achieving high data rates. She has introduced network control algorithms that specify how the wireless network entities must communicate, aiming at optimizing the rates both in the sense of maximal rates, as well as network fairness. Due to the complexity of obtaining the optimal network access solution, she has also been interested in efficient heuristics (educated guesses based on intuition), which although suboptimal in general, give valuable insights on optimal network access. Throughout her research she employed a blend of interdisciplinary methodologies borrowed from probability theory, deterministic and stochastic optimization theory, and graph theory.